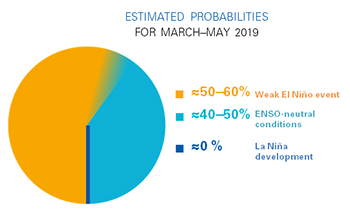 According to the Bureau of Meteorology latest ENSO Outlook, the current neutral El Niño–Southern Oscillation (ENSO) has been raised to an El Niño ALERT. The chance of El Niño developing in 2019 has increased to approximately 70%, around triple the normal likelihood. In Australia, El Niño typically cause reduced rainfall, warmer temperatures and shift on the extremes, reduced tropical cyclones and delay on monsoon onset.